Ed Troyer, a spokesman for the Pierce County Sheriff's Department, said on Twitter the man was suicidal and there was no connection to terrorism. Video showed the Horizon Air Q400 doing large loops and other dangerous manoeuvres as the sun set on the Puget Sound. There were no passengers aboard. Authorities initially said the man was a mechanic but Alaska Airlines later said he was believed to be a ground service agent employed by Horizon. Those employees direct aircraft for takeoff and gate approach and de-ice planes. The U.S. Coast Guard sent a 14-metre vessel to the crash scene after witnesses reported seeing a large plume of smoke in the air, Petty Officer Ali Flockerzi said. 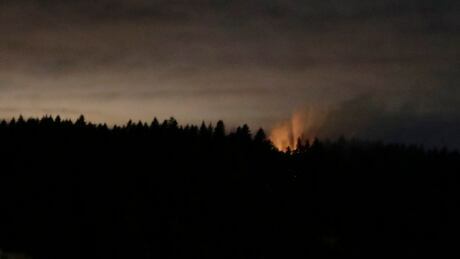 Video showed fiery flames amidst trees on the island, which is sparsely populated and only accessible by ferry. Officials with the Transportation Security Administration, the U.S. Department of Homeland Security and the Federal Aviation Administration directed inquiries to local authorities. Toll-free: 1-833-456-4566. Text: 45645. Chat: . Kids Help Phone: Toll-free: 1-800-668-6868. Chat: App: Always There by Kids Help Phone.